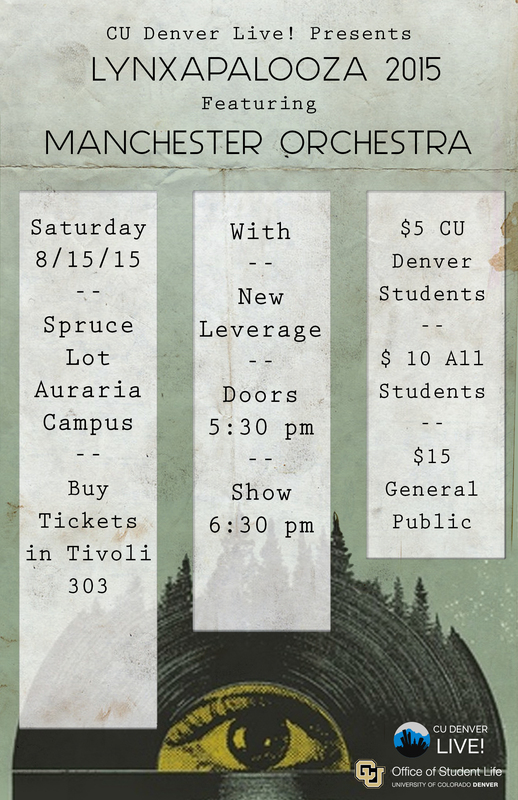 Fall 2015/Spring 2016 – CU Denver Live! Lynxapalooza was a jamming success! Over 700 people came to enjoy music, great food, and wonderful company. The evening started off with the talented DJ Wyld Kard, who got the crowd pumped up for the opener, New Leverage, and the headliner, Manchester Orchestra. Everyone enjoyed the music and energy. Tasty meals were brought to us by food trucks Biker Jim’s and Los Molinos. This was an incredible night filled with passionate artists and delicious food. Thank you to all our talent, sponsors, volunteers, food trucks, and of course, to all the students who came out to enjoy the night with us! Taiko in the Tivoli consisted of both an interactive workshop and a performance. Students we given the opportunity to take a short class on taiko drumming and flute with the Taiko team. Later, the students talents were displayed as they played with the professional drummers and even had the chance to perform solos. Students were drawn to the performance by booming drums of the traditional Japanese percussion exposed students to the important culture and art of expression. We hope this event gave students a relaxing and educational break from their studies! We took a group of students to Cook Street School of Culinary Arts to get their grill on. After being greeted with delicious appetizers, we grilled salad, steak, and pound cake! By the end of the night students were very full of food and knowledge about knife skills and grilling techniques. Chef Adam even taught us a bit about the science behind food and culinary preparation. Thanks once again to the Cook Street School for hosting this fun event and all the students who were able to attend this night of fun and food. Students were drawn in by the combination of arts, and got to watch fellow peers perform original music while engaging in dialogue with Armando about his work. Thanks to all the performers and students who attended! The painting will be donated to The Children’s Miracle Network. Masterpieces & Milkshakes was an exciting and educational event held in the Tivoli Turnhalle. We collaborated with JTOH (Journey Through Our Heritage) and LUAA (Latinos Unidos Across Auraria) to bring in an educational element with Dia de los Muertos. We kicked off the night with an informational presentation about the holiday that celebrates the lives of friends and family who have passed on. The rest of the night was spent painting sugar skulls on canvas while sipping horchata and dulche de leche flavored milkshakes. We loved hosting this annual event, and are excited about the educational twist this year. The Art of Storytelling featured Rose Red Elk (Lakota/Nakota-Assiniboine), who taught our audience about the importance of knowing and sharing one’s personal story to pass down cultural values. She shared with us the history of her Lakota culture and how it influenced her as an artist and storyteller. We collaborated with CU Denver’s AISS (American Indian Student Services) and EOP (Educational Opportunity Programs) to ensure authenticity and engagement for this one-of-a-kind event that limitlessly inspired our students. CU Denver Students had the opportunity to swing by our event held in the Tivoli Turnhalle on March 9th, 2016 to experience our one and only Coffee and Crafting. CU Denver Live! supplied coffee and numerous crafts from designing your own coffee mug, making your own scrabble coaster, and more! Students mentioned how this event supplied a relaxing moment in the midst of the midterm stress. CU Denver Live! teamed up with the Women’s Resource Center to create an event centered around why we need feminism. We had slam poet Blythe Baird speak to students about feminism while students crafted on quilt squares stating why feminism was important to them. After the event was finished, the CU Denver Live! team created a quilt out of students quilt squares to display at the feminism awards. CU Denver Live! teamed up with the Dance Marathon committee to create this year’s Lynx-a-thon. Lynx-a-thon is a marathon night of dancing, fun, and entertainment, in the hopes of raising money for Children’s Hospital Colorado. We had a great line up of talent, from the CU Denver Cheer and Dance team, to swing dance lessons, Voz de la Clave, and Alex the Great! It only costs $15 to register, and all our funds went directly to children’s hospital. Throughout the night we raised $5,400 for the hospital, and hope to raise even more in the future. CU Denver Live! presented a night of steampunk swagger and artistic immersion for students to attend Sweeney Todd. The musical was scored by DeVotchKa, a gypsy punk Denver band, and took place at the Denver Center for the Performing Arts’ Stage Theater. Before the musical, a pre-party was hosted in the Tivoli on Auraria Campus for students to hang out with their buddies, meet new friends, play some fun games, and eat delicious food. It was a relaxing evening that shared with attendees an unconventional piece of the expansive art and music world. CU Denver Live! teamed up with Illegal Pete’s to present an amazing concert featuring four CU Denver bands (One Flew West, Chloe Tang, Overslept, and Avenhart) who battled it out for the opening slot of Lynxapalooza 2016. The first 25 students to arrive were treated to a free burrito, and everyone enjoyed a fun evening of music that helped celebrate the end of finals week. Based off of audience votes and a grading rubric evaluated by four esteemed judges, Avenhart won the competition and will be opening for a nationally touring band at Lynxapalooza in September.